So age and gender are the two main filters that people use to start browsing clothes on a physical store and also on the web. I understand this, they are in fact the two most probable mutually exclusive criteria: "Someone who is looking for women clothes most probably isn't interested in simultaneously looking for man clothes", "Someone who looks for adult clothes isn't interested in simultaneously looking for kids clothes". 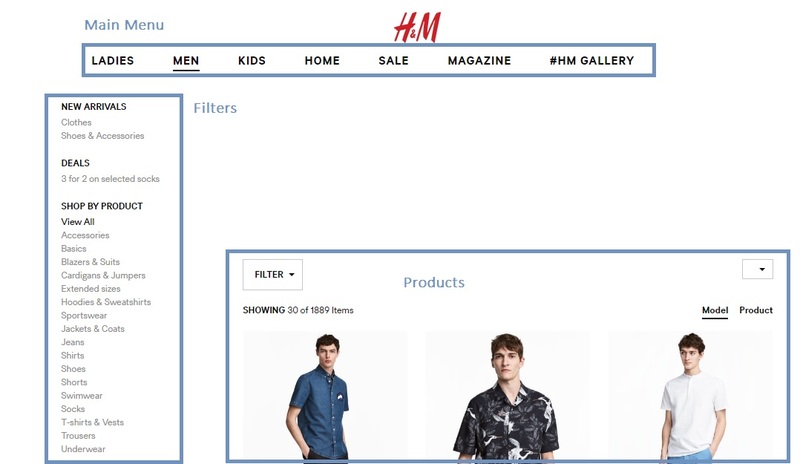 But this isn't really necessary in a web environment, people could just enter the store and see all products and then have the filters at their disposal, including the typically "man" and "women" filter that is commonly showed on a main menu (in my case "girl", "boy" and "unisex"). This is helpful in my case where i think soon to be mothers would like to browse kids clothes without having to limit the browsing to a gender or age. Why? Because the gender of the baby may be unknown and although they could browse the "unisex" department they may also like to see the options for boy and girl simultaneous. The may have twins, a boy and a girl, and would rather shop for both of them at a time. They may also like to browse clothes for 3 month old and 6 month old at the same time, babies grow very fast and mothers sometimes purchase clothes for different ages. In conclusion, age and gender are not as mutually exclusive in babies. Then all the filters, including the typical "boy", "girl" and "unisex" would appear on the side bar. Could you have them as icon? One of a male and one of a female, after they've already selected children's - that should be fairly clear. Then, for unisex you could either let them select both, or have a third icon of a boy and a girl - ensuring to take advantages of tooltips so the user knows what they're pressing? Since your domain in more focused, you could use the homepage to reflect on the new styles/trends leading to the inside pages. Baby clothing is a very much of an emotional buy, so you could think of making the experience more about emotionally uplifting pictures/copy and overall content. Home page that shares real pictures of mommies borrowed from Instagram etc could be some options. What I intent to say is keeping the home page as a emotional bait rather than immediate sell could help. Now coming to the inside pages, menu and filters. A menu item having three options seems good enough. 'Babies', 'Mommies' and 'All things cute' for example. The third one could be the one having all the accessories, toys, teething stuff etc. You know best! An area to keep all the 'extras' basically. In both the babies and the mommy section, you could then use the left filter bar to segregate the items by age/gender/sizes etc. I like how Nordstrom does that. You can also think of the top aligned horizontal filtering bar. A super read here. Highly recommended. I'm a big fan of free text and have started to move away from lengthy, multi-depth menus. We've found allowing the user to type: "mens shoes" even adding "mens casual shoes brown ten," is pretty efficient, however it requires your data to be configured to support this method and the way you handle the query terms so that they return relevant results is very important, especially with fuzzy/misspelt words. Just another option which may or may not work for your org. Not the answer you're looking for? Browse other questions tagged navigation e-commerce or ask your own question. Double click to edit, but how to navigate? How can I show the user where they are in a non-hierarchical page structure?